The return of Star vs The Forces of Evil with last week’s 8th episode, definitely re-ignited a lot of the fandom’s pent-up energy, and gave us one of the more solid episodes in some time. As we moved on to episode 9, I will admit I didn’t know quite what to expect from the previews, but enough of my babbling…let’s dive right in! When Marco wakes up late, he madly rushes to make it to school in time for his 7:56 AM ritual – to be at his locker as Jackie Lynn Thomas skateboards by. However, with just a few minutes to spare, Marco asks Star for help, and with a wave of her wand, she ends up freezing time. After partaking in some frozen-time antics, Star attempts to unfreeze time, only to find out that Father Time (voiced by Jim Gaffigan), has stepped off the Wheel of Progress. Star and Marco travel to the Plains of Time, where they find the old man eagerly running around the strange landscape, with little care about wanting to get back to his neverending grind. I will admit, as soon as Jackie Lynn Thomas came into the picture for this episode, I was hooked. The Jackie/Marco crush story development is something I’ve been curious about for some time. It hasn’t been a constant in most episodes, and any little hints that Marco still pines for his dream girl, definitely make me eager to see more. As well, much like in the Match Maker segment of episode 2, Star is also an encouraging figure regarding Marco’s love life. This episode was also fun because of a lot of little cameos (we even get a brief glimpse of what Gustav from episode 4 is up to!). Most intriguing to me, was when Star addresses Glossaryck (of Terms), the little creature in her wand’s spellbook. This put to rest one of the questions I had since seeing the episode 6 segment, Mewberty, in which he was introduced by name. Father Time isn’t the best supporting character, but he does have his moments. Gaffigan voices him like a person who has just come to life, eager to see and do things beyond the smaller scope of his lifetime of simply turning the Wheel of Progress. In a sense, his wild abandon running around the Plains of Time, is almost reminiscent of Star’s romping around Echo Creek Academy when Marco first showed her around in the first episode. During our visit to the Plains of Time dimension, we get plenty of little tidbits regarding Star and Marco’s past (and a tiny glimpse into the future, perhaps?). Those past glimpses are always welcome by me, as they help add more pieces to the puzzle in my head regarding who these characters are. Almost every animated show seems to have an episode that deals with time disruption in one form or another, and this looks like it’ll be the one for Star. The use of back-story and character insight for Marco was what definitely drew my attention, as well as getting to get brief glimpses into Star’s past. Plus, one has to wonder if the episode’s message, might push some to…take a chance? After Star’s Mom kicks her Dad out of the castle, the King of Mewni decides to crash at the Diaz’s place on Earth. Though at first excited that her Dad isn’t as overbearing towards her as her Mom, Star soon begins to tire of his presence when he keeps her up at night, let alone leaves his laundry lying around (I’m sure the same scene I saw will also have you shivering in repulsion!). Things don’t get much better when the King decides to take up residence on Earth, and throw a massive party with other dimensional royalty in attendance. Much like Freeze Day, Royal Pain gives us a little more insight into some characters, in this case, Star’s Dad. We saw a little of his wild ways in the segment Diaz Family Vacation, in episode 5. Here, it pretty quickly becomes evident just where Star gets some of her wild-abandon in some situations. Marco even makes note of this, though it is a little fun to see that maybe some of Star’s Mom is alive in her as well, given how she wants some order to the chaos her Dad has wrought. A minor subplot that weaves its way through the episode, involves Marco and wet socks, which I found slightly humorous, because wet socks also bug me in the same way. Fortunately, it doesn’t fall flat like the “mess-up twins” subplot in the Pixtopia segment of episode 6. Also like Freeze Day, we get quite a few return nods to previous characters, and foreign dignitaries, not to mention a few other new personalities that the King knows. I wobbled back-and-forth on my feelings for this episode. Much like how Party with a Pony dealt with the typical ‘friend doesn’t like other friend’ storyline, this worked on slightly altering the ‘my relative is driving me crazy and won’t leave’ plotline we’ve seen done in most series. Sadly, it didn’t feel like Royal Pain really did much to make my mind stray far from thinking of how formulaic it was at times. Don’t get me wrong. It does have its moments, and I did laugh out loud several times, but I felt the story just didn’t hold together as strongly. What does save the story to me, is its comedic moments. Though I did enjoy Freeze Day more, I laughed more at Royal Pain. A fun moment was when Star panics at seeing her Dad on the Diaz’s doorstep. I will admit having almost the same anxieties when my own Dad visits, and like Star, I usually freak out, making sure the place looks presentable (and most people I know go into the same sort of ‘panic mode’ when their parents come to town). I didn’t know quite what to expect from episode 9, but it definitely surprised me regarding some of its twists and turns. Freeze Day looked a little too wacky when I first saw preview clips of it, but turned out to be a little deeper, in how we got to explore some of Marco and Star’s backstory, let alone get some character callbacks. Royal Pain was definitely the weaker of the two stories, but made up for its shortcomings with the placement of its humor at times. Plus, we get a few more glimpses into other-dimensional royalty, and see Star may have a little bit more of her Mom’s responsible personality than we thought. One of the most decent episode releases so far, but not as intriguing as the previous episode. I will admit, it’s probably the episode most chock-full of cameos and background characters I’ve seen yet. And so, the constant stopping and lurching forward of another DisneyXD series, continues. After a month-long wait after 2 episodes, we have finally reached the 8th episode, of Star vs The Forces of Evil. And, if the numerous freak-outs and fan-art I’ve seen generated from its previews are any indication, it might be one of the most anticipated episodes so far from the series. But enough chit-chat…let’s dive right in! While at school, Star is shocked (and annoyed) when her ex-boyfriend Tom shows up, to invite her to The Blood Moon Ball. Star is at first against the proposal, but decides to give Tom a chance, as he claims he’s been working through his anger issues. Of course, Marco is convinced that this isn’t a good idea. Up until now, many have been intrigued by the enigma that is Tom. Having been seen in the opening credits, and a small cameo in the segment Match Maker, this is the first full appearance of the demon. Rider Strong (Girl Meets World) voices Tom with a suaveness that befits his looks as a teenage bad-boy (why do girls always go for the bad-boy? ), though with a tinge of something possibly dangerous underneath. I will admit, the thought process of the episode reminded me of the Lobster Claws segment from episode 7, given that Marco felt Claws could be good, and Star claimed monsters are just plain evil. In this case, Star is convinced that a demon can get over his anger issues, while Marco doesn’t trust Tom’s words. This scenario leads to an interesting discussion in the last few minutes of the episode between Star and Marco. It feels like this could become character development, but given most series, it’s hard to say if this is just development within this segment, or if it will carry over into future episodes. That to me is the issue with having two 11-minute segments per episode: getting any form of character development is sometimes hard to decipher. Even so, the episode ends up showing us a little bit more about Star’s past, while also delving a bit into her relationship/friendship with Marco. Of course, given a few scenes in the episode, we’ll probably have more people making mountains out of molehills regarding where these two crazy kids are heading. Like most of my previous episode rantings, I do wish Blood Moon Ball had more time to develop the segment. Even so, I was also surprised that it had plenty of decent comedy beats that gave me a chuckle. After winning another battle against Ludo and his minions, Marco treats Star to some Chinese food. When they receive fortune cookies at the end of the meal, Marco has a little fun with Star’s inter-dimensional naivete, claiming the fortunes inside are real. Unfortunately, Star soon won’t make any decision without opening a fortune cookie. I’ve been a fan of ‘Star-meets-naivete’ plotlines ever since the School Spirit segment, and I was pleasantly surprised with how the writers handled this one. I will also go on record and admit that there have been some fortune cookie fortunes I have actually believed in (one last year seemed to foretell of a job promotion I was finally able to obtain, and it’s still taped to my work laptop), The storyline makes me also feel that the writers may have used their own experiences in crafting a rather entertaining tale. I was also surprised at just how well Ludo’s subplot tied into the whole episode. Toffee (voiced by Michael C Hall), comes across as a very sophisticated individual, and doesn’t quite operate on the same level of ‘smash-and-grab’ like we’ve seen Ludo and his guys do many times. Toffee’s methods seem a little more cunning. Even his way into Ludo’s employment is through unconventional means. Given the way the story was structured, a fun character surprise was seeing how Ludo’s minion named Buff Frog, seemed a little unsettled by how quickly Ludo had taken a shine to his new employee. This could possibly lead to some more characterization for one of Ludo’s right-hand minions in the future. What was most intriguing for me story-wise, was the final 30 seconds of the episode, which gives an ominous feel that reminded me of why I really loved the segment Monster Arm so much. Something has definitely been set in motion by Toffee’s appearance. I have no clue what that might be…BUT I WANT TO FIND OUT!!! Episode 7 (Lobster Claws/Sleep Spells) was pretty entertaining, but I think that this Episode was more of a win-win with what we got to see here. 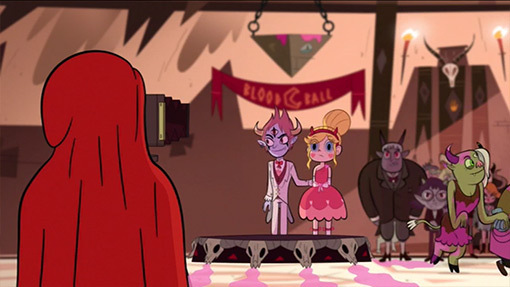 With Blood Moon Ball, we finally got to see and know about Star’s ex-boyfriend Tom a little more, and got a little character-building regarding Star and Marco (and of course, some more fodder for the fan-shippers out there). With Fortune Cookies, an added tinge of mystery surrounds the newly-introduced character named Toffee, though the episode does pretty well giving us the humor with Star’s fortune cookie obsession, and making us wonder just what Toffee’s end-game is. Both of these episodes I can see getting quite a bit of replay value from me, and I look forward to perusing through the episodes a bit more. What was a little strange, was the animation quality appeared to change a few times. In one of my previous reviews, I mentioned how Toon City in the Philippines was taking over from Mercury Filmworks in Canada. Though in the credits for this episode, another studio was mentioned: Rough Draft Korea Co., LTD.
My assumption is that Rough Draft may have been brought on board as an 11th hour ‘helper studio.’ I did an internship with an animation studio almost a decade ago, wherein we’d finish some extra work for television commercials, and I could see that maybe being what this studio did. After all, if one notes the quality of animation in parts of Blood Moon Ball where Tom first arrives at Echo Creek Academy, the character styles seem a bit odd, and Star’s animation of dragging Tom back to his carriage, feels a little lower-class than usual. In the last decade, film sequels have grown in prominence, as one of the most important types of films in Hollywood. While many lament and complain that the studios should invest in something more ‘original,’ many studios just keep to the old tried-and-true, of making sequels until the series crashes and burns…and when that happens: re-boot! That was what happened following films like Batman & Robin, Superman Returns, and 2007’s Spider-Man 3. In recent years, a number of films have taken familiar properties from decades before, and toyed with altering their timelines. 2009’s Star Trek took familiar characters, and shifted our viewing of them to an alternate reality. In 2011, the re-imagining of The Planet of the Apes, threw us into an origin story taking place in our own time. One series that has often been fickle with its timelines, is that related to James Cameron’s Terminator films. With his first two films, Cameron largely kept the idea of nuclear annihilation as a looming threat, but the films made after he chose not to return, just seemed to imply that the public had to get to Judgement Day, and beyond, along with the stipulation that Arnold Schwarzenegger…would be back. After the success of 1991’s Terminator 2, Hollywood attempted to take the series further 12 years later, with Terminator 3: Rise of the Machines. The sequel performed marginally well, but its 2009 follow-up, Terminator: Salvation, failed to kick-off a new series of films. 6 years spanned between those last two sequels, and now, 6 years after Salvation, a new production team (and film studio), has attempted to make what was old, new again, with Terminator: Genisys. The film starts in 2029, wherein we finally see what has often been talked of for over 30 years: the scene in which John Connor (Jason Clarke), sends Kyle Reese (Jai Courtney) back to 1984, to protect his mother, Sarah Connor (Emilia Clarke). Much like Jurassic World, Genisys beckons us in with touchstones and things we’ve seen before. While it may be cool to see an older T-800 battling his younger self, a lot of the timeline shifting soon gets to be a little cumbersome, as we go from 2029, to 1984, and then forwards to 2017. Kyle is also plagued by strange flashbacks, and thanks to the T-800 having information that he deems ‘classified,’ Arnold gets to spout lots and lots of technical time-travel jargon, that made me long for Doc Brown to come along, and make sense of it all! Speaking of our main characters, I just couldn’t find myself getting invested in them. No matter how I tried to accept Jai Courtney and Emilia Clarke (as well as Jason Clarke), their acting just didn’t seem believable to me. I almost felt like I was watching a community theater troupe, trying to tell the Terminator series in their own words. Emilia Clarke’s take on Sarah just didn’t cut it (she looks like a little girl playing dress-up at times), and Courtney just seems a little too ‘bland’ regarding his role. The script tries to even give them ‘character-building’ moments where they start yelling at each other, but the film just never makes these little arguments believable (I had to hold back chuckling at a few of them). Jason Clarke’s role as John Connor also gets tiresome pretty soon, as it seems he just cannot seem to ever shut up! Heck, I don’t think even in his whinier moments, Edward Furlong’s interpretation of John got this eye-rolling. The filmmakers try to throw in a small supporting role for actor JK Simmons as well, playing an officer who ran into Kyle in 1984. However, why they got someone like Simmons to play such a thankless role, is beyond me. His character could very well have been written out of the story altogether, and it feels like it wouldn’t have made much of a difference. Of course, the bean counters know that most audiences could care less about the fate of humanity. If the low numbers surrounding Terminator:Salvation were any indication, it was that audiences would not accept a Terminator film, unless Arnold Schwarzenegger had a prominent role. The T-800’s role in the film is really the only highlight (and most likely, the main reason millions around the world will be seeing it). Given that he has been among humans for several decades, this T-800 has had plenty of time to acclimate himself, though the film conveniently explains how this cybernetic organism can look like a 67-year-old former California governor. While the first few Terminator films strove to make the threat of Judgement Day seem ominous and threatening, it feels like that ship has sailed a long, long time ago. Such talk about stopping the impending doom seems little more than a joke. As well, the concept of John Connor being the most important person in the world, seems to have also lost its weight on the story. The writers have instead, attempted to make John something that only the early drafts of Terminator: Salvation fathomed (but were too afraid to go through with). Maybe they simply felt they had gone as far as they could with the concept of the character, and in this case, decided to throw him under the bus (literally in one scene!). Another area where the film suffers, is in its attempts to say that this is ‘just the beginning’ of a brand-new saga for the Terminator series. As such, it makes it hard to really accept that anything the characters do is concrete. As it stands now, the studio is banking on the film doing well enough to do a sequel or two, before the Terminator rights default back to James Cameron, come 2019. On the note of time-travel, one series that my Dad and I love, is Back to the Future. When we were discussing the three films of that series one day, my Dad stated that he preferred Part III over Part II. His reason? There was too much time-jumping in the second film. I could see where he was coming from with that thought, and in a sense, his feelings towards Back to the Future Part II, mirrored my thoughts regarding Terminator: Genisys. The film almost feels like it’s afraid to slow down, as if its audience will get bored if it even has any small, meaningful moments. However, in the first two Terminator films, it was those slower moments that allowed us to connect with the majority of the characters. In the end, Genisys will probably be seen by many as a slate-wiper for the last two Terminator films, much like how Jurassic World wiped out thoughts of Jurassic Park’s two sequels. Even so, it doesn’t really do much besides picking-and-choosing out some of the more memorable moments of the films that have come before, and trying to snap them into something that will hopefully appeal to the most jaded Terminator fans. As well, I’m sure we’ll be seeing plenty of people real soon, trying to make further sense regarding how these new timeline anomalies tie into the previous films.